This article contains past events. See Current events for upcoming activities. 3 How do we create the change we need in the time we’ve got? Call on the Premier Baillieu to stop taking Victoria backwards on our environment. After 12 disappointing months we're marching backwards to demonstrate the direction the Premier is taking us. Join us and hundreds of other concerned Victorians to turn things around for our environment. Engineers Australia and Engineers Without Borders are proud to bring you imagineering - the Humanitarian Engineering Conference 2011. How do we create the change we need in the time we’ve got? Find out at the Melbourne Green School. Leadership, climate change, campaign planning, health, global citizenship, multi-party democracy, biodiversity, media coaching, post growth economics, positive deviance ... discuss today’s most pressing issues, learn new skills, meet like-minded people. There are more than 20 workshops and training sessions to choose from and a fantastic array of presenters. Fees: $195 standard, $110 low income. This covers the whole weekend including lunches and dinner on Saturday evening. Part-weekend options also available. 12-27 Februuary, Melbourne, Including The Great Debate "Is environmentalism failing?" The Spot Basement Theatre, Business and Economics Building, 198 Berkeley St, Carlton. Send an email to climate.summit.2011@gmail.com for regular summit updates. Ashoka’s Changemakers has launched an online competition, Sustainable Urban Housing: Collaborating For Liveable And Inclusive Cities, to find the best solutions to integrate and develop affordable, inclusive and sustainable urban housing. This challenge especially seeks to identify solutions that respond to communities’ needs, work with the existing infrastructure, respect local, indigenous culture, materials, and practice, and can be applied to a wide range of locations. All solutions that demonstrate innovation, sustainability and a social impact, whether they are rooted in land rights and management, new technologies, transportation, financing, credit for the poor, and standards for accessibility, work-life balance, health, public safety, environmental quality, and citizen security, are encouraged! The most competitive entrants will be collaborations that incorporate affordable, inclusive, and sustainable ideas with tangible plans to be adapted and implemented in urban environments. This competition is being launched in anticipation of the 2012 Summit of the Americas, and in support of U.S. President Barack Obama’s Energy and Climate Partnership for the Americas (ECPA). It is funded by the Rockefeller Foundation, and is a joint effort of the U.S. Department of Housing and Urban Development, the U.S. Department of State, and the American Planning Association. Three winning innovations will receive a cash prize of US $10,000 each. Submit your entry by February 2, 2011, to be eligible to win. The most competitive entrants will be showcased and reviewed at an event that closes the competition in June 2011 at the National Building Museum in Washington, D.C. where they will be viewed by public and private partners, including prospective funders. Use the Changemakers community as a resource! The sooner you submit your entry, the more time the community has to comment on it, make suggestions and leave feedback, which you can use to improve your idea and proposal. Visit http://www.changemakers.com/sustainableurbanhousing to submit your innovation to the competition and for further details. You could also get in touch with me for any clarifications or assistance. Hazelwood Power Station is located in Victoria’s Latrobe Valley and is the single highest emitter of dioxins in Australia. Hazelwood emits over 16 million tonnes of greenhouse pollution and 27 billion litres of water each year. This is almost 15% of Victoria’s annual greenhouse gas emissions and equivalent to Melbourne’s combined water use for one month. World Environment Day on 5 June is a day that stimulates awareness of the environment and enhances political attention and public action. It was the day that United Nations Conference on the Human Environment began. The United Nations Conference on the Human Environment was from 5-16 June 1972. It was established by the United Nations General Assembly in 1972. The first World Environment Day was on 1973. World Environment Day is hosted every year by a different city with a different theme and is commemorated with an international exposition on the week that 5 June is on. World Environment Day is in summer in the Northern Hemisphere and winter in the Southern Hemisphere. The 2010 theme focuses on the central importance to humanity of the globe's wealth of species and ecosystems, in support of the 2010 UN International Year of Biodiversity. This year's global host, Rwanda - a country of exceptional biodiversity that has made huge strides on environmental protection - will lead the celebrations with three days of keynote events. Rwanda, was chosen for its combination of environmental richness, including rare species such as the mountain gorilla, allied to pioneering green policies. Hawthorn Town Hall, Burwood Road, Hawthorn. Has the political debate left you unsure about climate change? About your role in responding to it? Do we have the solutions needed? How can we make the necessary changes? This event aims to inform people about the latest climate change science and solutions for effective mitigation as well as facilitate participants’ contributions to a discussion about priorities for action. Local community groups are invited to attend and space for a display will be made available. 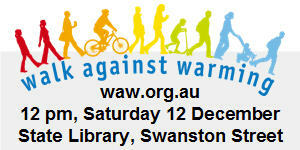 Walk Against Warming is Australia's biggest day of community action on climate change. The Melbourne event will begin at 12pm, Saturday 12 December at the State Library, Swanston Street. As World Leaders are gathering to discuss what action they are prepared to take on climate change, we'll be walking down Swanston Street to Princes Bridge, where we'll form a giant human sign to send them a message that Australians want a safe climate future. Please RSVP if attending. How can we match the Al Gore challenge by re-powering Australia with renewable energy in 10 years?. Matt will explain the exciting innovations and technologies that are already available and ready to be used in the path to de-carbonising Australia. Brought to you by Families Facing Climate Change. Get active to stop runaway climate change! Greenlivingpedia is working with live.org.au to promote this event. Earth Hour 2009 aims to reach more than one billion people in 1000 cities around the world, inviting communities, business and governments to switch off. A special event for Australia's Open Garden Scheme. The first grid-connected solar house in Victoria, the home and permaculture garden of a green makeover specialist. Information on sustainability; book signings. Breathing a new way of living into a former primary school, this ecovillage exemplifies water conservation and sustainable living. Low maintenance bush-style garden surrounding 15-year-old passive solar house with many sustainable features. Talks on achievable sustainable features at 10am, 11.30am, 2pm & 3.30pm. Delightfully disorderly permaculture garden surrounding sustainable house and featuring compost, worm farms and rare poultry. Japanese-influenced garden wrapping a purpose-designed passive solar house self-sufficient in water. Mature fruit trees frame vegetables and ornamental plants around an early 1990s passive solar house with sustainable features. Sunlight is maximised in clever renovation and retrofit of sustainable features in formerly dark 1930s duplex. Creative architect-designed renovation of narrow Victorian terrace using sustainable materials. Green building is transitioning to mainstream as businesses, individuals, and builders realize the long term benefits of efficient and environmentally sustainable facilities. At this free online summit, experts from the business, architecture, legal, and engineering communities will converge to illustrate best practices, case studies, and tips through interactive webcasts. Register to attend any or all sessions free of charge and invite anyone you think would be interested. As an audience member you will be able to ask the presenters live questions and each webcast will be a combination of slides and live audio. 10.30am -5pm, Saturday 14 March. Abbotsford Convent. NOTE: This inquiry was cancelled by the government because it had "become politicised". On 12 February the Treasurer, the Hon Wayne Swan MP, asked the Committee to inquire into and report on the choice of emissions trading as the central policy to reduce Australia's carbon pollution. The Committee invites interested persons and organisations to make submissions addressing the terms of reference by Friday 20 March 2009. Please refer to our brochure called preparing a submission for more information. 2009 will be the year the Australian climate movement turned the tide of history! People from climate change groups across Australia will create and launch a cohesive and strategic national climate campaign, form a national grassroots network, and send a powerful message on the eve of the second year of the Rudd Government that sets the agenda for urgent climate action. Second protest against logging of Brown Mountain old growth forest - at the last parliamentary sitting week for 2008. 12:30pm, Parliament steps, Bourke St and Spring St. Wear a suit or skirt/dress and bring your mobile phone if you have one. Just over 1 hour from Melbourne/15minutes from Warburton logging is scheduled in our pristine Cement & Armstrong Creek Water Catchments. Join the Warburton Community, the Yarra Ranges Shire Council and Environmental Groups to walk through Warburton to demonstrate opposition to the logging of our water catchments. Cement Creek & Armstrong Creek Water Catchments are on the doorstep of regional communities, including Warburton Marysville & Healesville. Their destruction will directly impact upon these communities. Come join your Yarra Ranges/Melbourne/Warburton community and celebrate the role native forests play in providing Melbourne & regional communities with a clean water supply, regulating our global climate & providing habitat for biodiversity. Thousands of Australians will walk together with their families, their workmates and their communities for renewable energy and a safe climate future for our children. Walk Against Warming is an urgent demand for real action on climate change and justice for developing nations affected by global warming. To celebrate this year, the Surrey Hills Neighbourhood Centre is organising a dynamic afternoon of fun and activity centred around the words on everyone's lips - sustainability! Rod Quantoc, Vox Bandicoot, the Governor of Victoria, the Surrey Hill Billies and Tim's Bookshop Band will be amongst locals and small businesses holding workshops and demonstrating ways to leave a Lighter Footprint. There will be a rich mix of food, fun, demonstrations, debates, performances, and competitions for kids to demystify and make sustainable living accessible." The Bright Sustainable Expo is part of the highly successful Bright Spring Festival. The Expo will feature exhibits on local flora and fauna, water conservation, worm farming and a range of sustainable building materials, products and designers. A key noter speaker and guest speakers will be an extra attraction. The first ever conference of the Open Sustainability Network! This is a BarCamp style conference about free content and knowledge sharing in sustainability, international development, appropriate technology and solutions to poverty. It is open to all those interested in these issues. $5 per person per house or $10 a family, funds raised go towards running the event. Phil Hart studied Materials Engineering at Monash University in Melbourne before spending five years with Shell UK Exploration and Production. He worked on two new North Sea oil and gas field development projects before joining the Brent field maintenance team as a corrosion engineer. In late 2006, Phil returned to Melbourne and is a member of the Australian Association for the Study of Peak Oil. He has provided briefings and presentations to all levels of Government and other business and community audiences.Phil's presents a coherent and robust explanation of why peak oil is near at hand and delivers a sober assessment of some of the alternatives to oil. We are calling for Victorians to join the Climate Emergency Rally on July 5. We want to send a wake-up call to state and federal governments that they are heading in the wrong direction. New coal, new freeways and desalination plants increase our use of and reliance on fossil fuels dramatically at a time when we must be cutting our use even more dramatically. We are calling on governments to implement sustainable alternatives to these irresponsible and expensive projects. We call on all community groups and individuals to join us to send this important message to the government. We are going to form a 140-metre-long human sign to spell the words "Climate Emergency". Please organise your group to send endorsement, tell everyone you know, and come on the day wearing something red to symbolise emergency"
What happens when Dwell editors drive the agenda? A roster of more than 50 incredibly talented and diverse speakers ranging from legislators to practitioners to activists, discussing everything from urban gardening to a mandated LEED program for LA. The conference follows two parallel tracks but we encourage you to veer from the linear and sign up for any panel that sparks your interest. Everything you ever wanted to know about modern design in one very big place: 200+ exhibitors, an entire neighborhood of full-scale pre-fab strcutures completely landscaped and furnished by Dwell. Plus you'll get hands-on, actionable advice and information from architects, designers and other trade professionals. Get out of the ivory tower and into some real homes. We’ve set aside Saturday for single-family dwellings on the Westside and Sunday for urban dwellings downtown. One-on-One with the most innovative minds in design. Meet the people who are moving and shaking the industry. Experience 55,000 square feet of ideas with over 200 exhibits. Visit a pre-fab community complete with furniture and landscaping. Leave inspired and motivated to be at home in the modern world! Held on World Environment Day is an initiative I created with an intention to move the current and rapidly exploding mainstream wave of consciousness and interest in environmental issues and all things green into action! Going Green Expo will suprise you with new products and solutions to stop your environmental rot and replace traditional consumer nasties with environmental friendlies that can now save you money and don't cost the earth! When: Sunday 20 April 2008, 11.00am to 3.00pm. Entry: gold coin donation at the Village Green near the Cafe." Who: Professor Manfred Kohler, chairman of the World Green Roof Infrastructure Network will give a lecture at the Melbourne Town Hall tomorrow. The climate movement convergence seeks to bring together the remarkably diverse climate change community we have here in Victoria, including local climate action groups, peak green groups, thinkers and strategists, social activists and other sectors concerned about climate change, and progressive businesses. We aim to provide an inspiring day of workshops, open space for discussions, an overview of the latest climate science, ideas on building a strong and vibrant movement, and the opportunity to ponder what opportunities are now present with a change in federal government. workshops – there are two workshop sessions - one on campaign themes, and one based on geographical regions. Anyone can propose a workshop. The convergence is being organised by the Sustainable Living Foundation (SLF), Friends of the Earth (FoE), the Greenleap Strategic Institute and Sustainable Business Practises and is supported by a range of climate groups including Beyond Zero Emissions (BZE), Carbon Equity, Central Victorian Greenhouse Alliance, Environment Victoria, Futureye, Greenpeace, Moreland Energy Foundation, Western Region Environment Centre and Zero Emissions Now (ZEN). Visit www.walkagainstwarming.org for walk locations in your capital city. Friday 19 - Sunday 21 October 2007, Melbourne Exhibition Centre (Jeff's Shed). Website Open 10am - 7pm daily Adults: $15, Student/Concession: $13, Children under 14 free. Australia's largest showcase of products and services which save water and energy. Green building products, solar hws & heating, rain tanks, grey water systems, energy efficient appliances and lighting, water savers, and much more. See, try and buy everything for your home, workplace and garden to cut your water and energy bills. Learn from the free seminars, get advice from the experts, and buy using the various government rebates. a range of sustainable building materials, products and designers. Guest speakers will be presenting on a variety of topics. The Benalla botanica Horticultural Conference will look at how to make the change from water hungry gardening in a creative way - the theme is Gardens in a Changing Climate. There will be presentations from several guest speakers. Fraser Brindley from Melbourne City Council will be launching Greenlivingpedia at 10am at the CH2 building in Little Collins Street Melbourne, just near Swanton Street. Where: CH2 Building, corner of Little Collins Street and Swanston St (next to Town Hall). Sandringham Beach - we want your body!!! 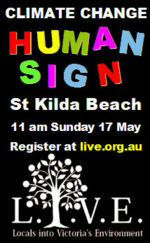 3,000 volunteers needed to create a "Human Sign" to form the message "HALT CLIMATE CHANGE NOW!" 10am SANDRINGHAM BEACH (Life Saving Club). BYO Water, sunscreen, hats, umbrellas. We will do this rain or shine. The Bayside Sustainability Expo to follow immediately after. Sporting clubs, businesses and school groups can come in uniform and be grouped together. DARK COLOURED CLOTHING SHOWS UP BEST. For more information, contact Coni Forcey at (03) 9598-3272 or visit the Bayside Climate Change Action Group website. Supported by Environment Victoria and Greenpeace. This page was last modified 00:05, 26 November 2015. This page has been accessed 153,452 times.